Die Bischöfe des Heiligen Römischen Reiches / The Bishops of the Holy Roman Empire (BHRR) is a biographic database on the bishops of the Holy Roman Empire. It comprises more than 4400 biographies of bishops who officiated between 1198 and 2001 The notes from this biographical dictionary were all written by specialists under the direction of Erwin Gatz. The geographical coverage is much wider than the borders of Germany, since the term of reference is the entire Holy Roman Empire. Thus, the countries involved, in whole or in part, include Germany, Austria, Switzerland, Luxembourg, Belgium, France, the Netherlands, the Czech Republic, Poland, and northern Italy, among others. This database is integrated into the Dictionnaire d’histoire et de géographie ecclésiastiques (DHGE) and is offered to subscribers to the DHGE as part of their subscription. 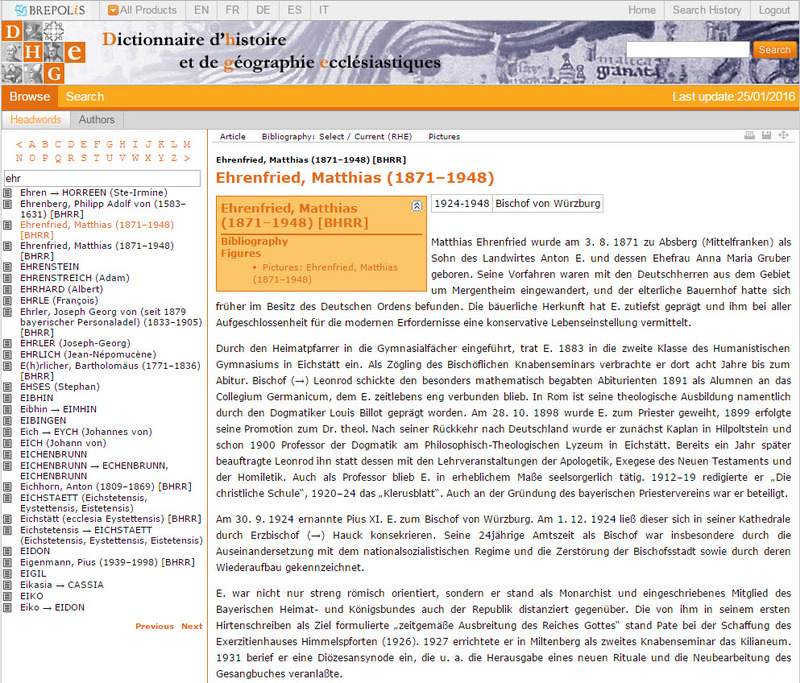 This database is searchable via the DHGE interface, and includes links to the other Brepols databases.